I just read what Google posted few days ago "How are videos ranked". It quite interesting that they try to defense what people talking about their bias of search results. You can see what they wrote here. Our intent is to represent the video content of the internet fairly and accurately. We don't give special ranking preference to videos hosted by YouTube or Google Video, nor do we manipulate search results in any way. We believe strongly in allowing the democracy of the Web to determine the inclusion and ranking of videos in our search results. After determining the content of the video using our spidering technology, Google then combines sophisticated text-matching techniques to find videos that are both important and relevant to your search. Our technology examines dozens of aspects of the video’s content (including number of hits and rating) to determine if it's a good match for your query. Please be assured that we’re continually working to improve our algorithms to provide the most relevant results for your query. What I see is far different from what they wrote above. 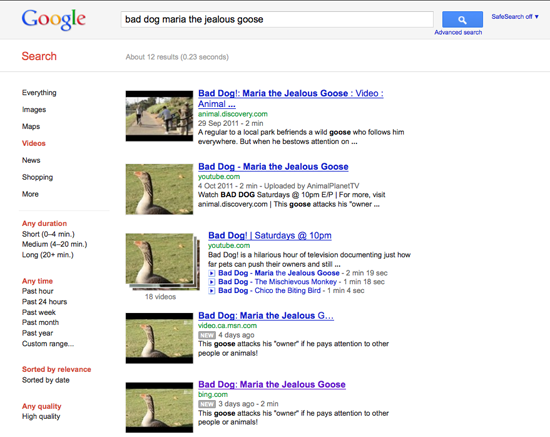 Try this query "Bad Dog: Maria the Jealous Goose Bing Video", this query is very strong intent that users are looking for Video for Bad Dog : Maria the Jealous Goose Video from Bing. 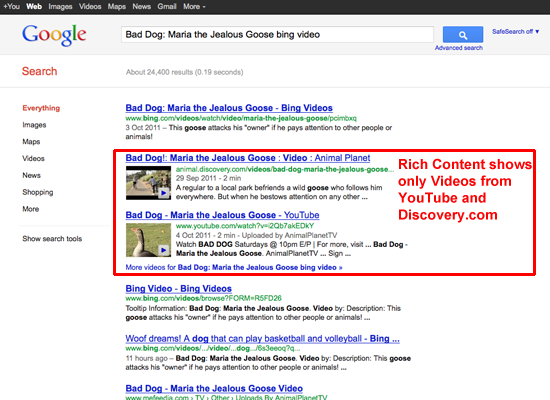 Unfortunately Google is not display rich content for their video but show rich content from YouTube and Discovery.com. 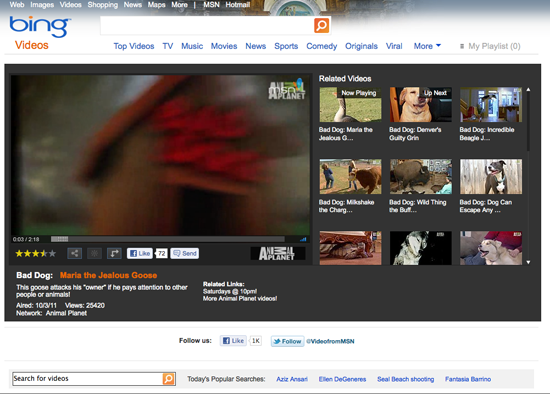 This Video is available at Bing Video and found that Google indexed their video.